The Federal Voting Assistance Program (FVAP) has released updated versions of the Federal Post Card Application (FPCA) and Federal Write-In Absentee Ballot (FWAB) for the 2018 election cycle. Overseas citizens may use the FPCA to request absentee ballots, register to vote, and update contact information, and in the event that a requested absentee ballot is not received in a timely fashion, we can vote using the FWAB as a backup ballot. Both the FPCA and FWAB forms are accepted by all states and territories in elections for federal office. 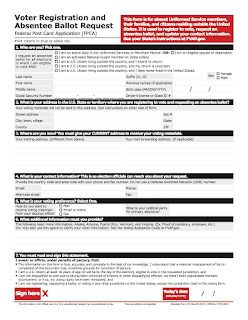 Voters have the option of using other types of absentee ballot request forms, but Democrats Abroad strongly encourages all overseas voters to use these federal forms to guarantee certain protections — such as the option to receive a ballot electronically and the requirement for election offices to send ballots to voters at least 45 days before elections for federal office. If you are a former resident from any of the states and voting districts listed below, go to VoteFromAbroad.org and complete the form to request an absentee ballot or to register to vote. 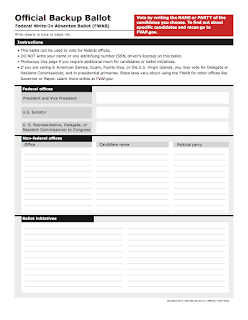 Print and sign the form and then send it to your election office to ensure you will receive a ballot for the election. Many states accept scanned forms by email or fax. Please mail your voting materials early enough to account for mail delivery times. No elections in your jurisdiction? Take action by joining Democrats Abroad phonebanking to support Democrats running in the New Jersey and Virginia State Elections, as well as the Special Election for Florida's State Senate 40th District. These are the first phonebanking campaigns for the Fall elections — with more to come. The phonebanking campaigns will start on Friday, August 18 to coincide with the Democratic Party's "Weekend of Action". And to sweeten the pie, DA is giving away our famous "donkey bags" to any phonebanking volunteers who make more than 30 calls this weekend (from Friday through Sunday evening Pacific Time). → New volunteers: Follow the instructions to sign up for phonebanking. → Returning phonebankers: Review the updated list of Callhub Caller Do's and Don'ts and then go to https://callhub.io to login into your CallHub account. Overseas citizens should go through the process of requesting an absentee ballot for the handful of States holding special elections in 2017, by completing the Federal Post Card Application (FPCA) form. The same form is used by first time voters to register, and covers all federal elections in the calendar year, including primaries and runoffs. If you are a former resident from any of the states and voting districts listed below, go to VoteFromAbroad.org and complete the form to request or register for an absentee ballot. Print and sign the form and then send it to your election office to ensure you will receive a ballot for the election. Many states accept scanned forms by email or fax. How do we bring political discourse back to a place of civility if we cannot even stand on a foundation of truth? Conserve energy, don't feed into the frenzy by wasting your time with propaganda websites that profit off of this hyper-political reality with click-bait headlines. 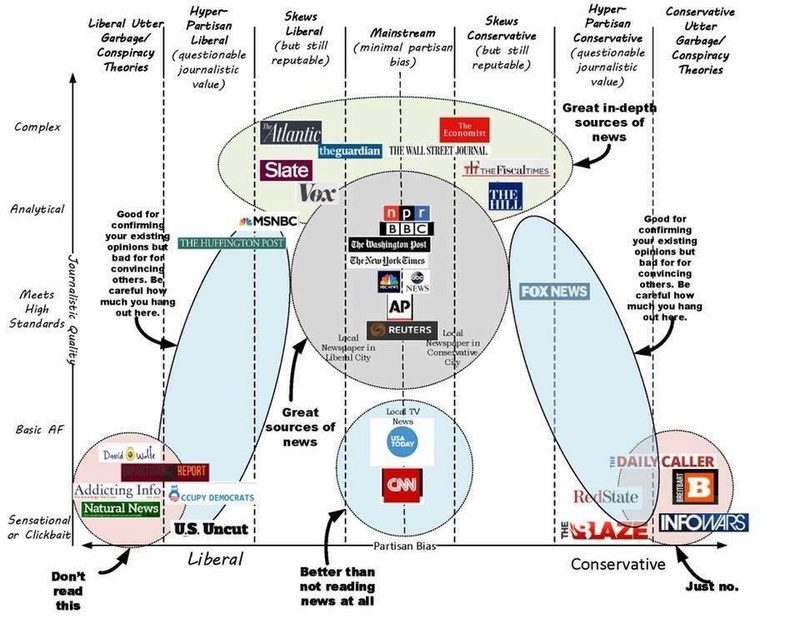 Certainly not complete, but a good place to start, here is a list of websites that have been identified as distributing faux news targeting liberals. Evaluate for yourself, let us know if you disagree or think others should be added.